Part 1: The Power of Positive Thinking – Where Did This Simple Idea Come From? It should be no surprise that I suggest that SEALs employ positive thinking as a key tactic for mission success. Without it, SEALs would find it difficult to work as a team, or make it through an intensive training like Hell Week. But the skill is not talked much about, only in the context of managing internal dialogue. It isn’t practiced either, per se. It exists in the successful SOF candidates as a trait either accrued from their upbringing, through parents and/or influential mentors or perhaps their very DNA carried the seeds of a positive mindset. But where did this simple idea, that positive thinking can influence outcomes positively, come from? Has it always been part of our cultural norm? And by the way, what the heck has happened to it recently? It seems that our media and political establishments are working overtime to turn back time and eradicate this important part of the American cultural history: that what you believe is possible is actually achievable. I recently discussed this topic on the Unbeatable Mind Podcast with Mitch Horowitz, who studied it in depth for his book One Simple Idea. The conversation was interesting enough to follow it up with a blog series. Mitch says the notion that the philosophy of developing and maintaining a positive mindset, directed at the accomplishment of a worthy aim, is “The American Creed.” What he means is that positive thinking has so impacted our culture, from business leaders, the political establishment and even the working class, that it forms a core ethos for our country. Though the concept of positive thinking dates back thousands of years as espoused by various spiritual traditions, it has become a uniquely American ethos, one not shared by most other cultures. Early Americans transferred the idea, originally associated with attainment of spiritual enlightenment, to the materialistic and achievement arena. The transmutation of the power of positive thinking from spirituality to wealth and entrepreneurialism began with the likes of George Washington and Benjamin Franklin, later expanded upon by authors Wallace Wattles in The Science of Getting Rich and Napoleon Hill in Think and Grow Rich. Although both of these authors aimed their books titles at material wealth, Wattles and Hill acknowledged that “rich” didn’t have to solely mean “wealthy,” in a monetary sense. It also meant mental, emotional and spiritual health. In fact, they maintain that the “richer” you are mentally and emotionally, the more resilient you will be, and thus the easier you will find it to focus on a goal and take powerful action towards achieving it. We learned from these early proponents of The American Creed that thinking in a positive manner, focusing on solutions rather than problems and not allowing negative thinking to derail us, is essential in the pursuit of worthy goals. By cultivating a positive, forward-thinking attitude, one is better able to adapt and overcome the obstacles that will arise. Obstacles become opportunities to learn from, creating a clearer and stronger path towards mission success. Positive thinking also inoculates you from the herd mentality, which is invariably biased negatively. By breaking from the herd, which always seeks reinforcement and is openly critical of others, the positive thinker adherent is able to tap into a resiliency that keeps them moving in spite of constant setbacks, much like Franklin and Washington during the formation of this country. Positive thinking allows you to embrace change, look forward to the obstacles and be less reliant on the opinions of others. The positive thinking is willing to become the change they want to see in our world, rather than wait for someone else to effect that change. Stepping away from the herd, breaking your biases and habitually practicing positive thinking are core concepts I discuss in the Unbeatable Mind Academy. These are skills foundational to mission success for individuals and teams. In the next post, I will continue this discussion of The American Creed. Until then, stay focused, train hard and feed the courage wolf! Great article, as always coach Divine! 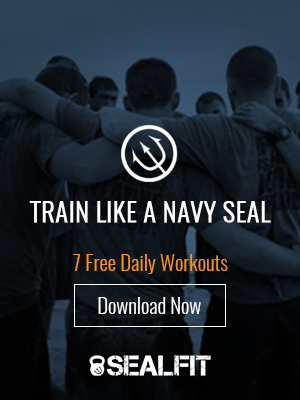 I will take this opportunity to thank you for all the lessons learned in 1.5 year of following Sealfit and reading the blog and the books…Thank you and Hooyahh!